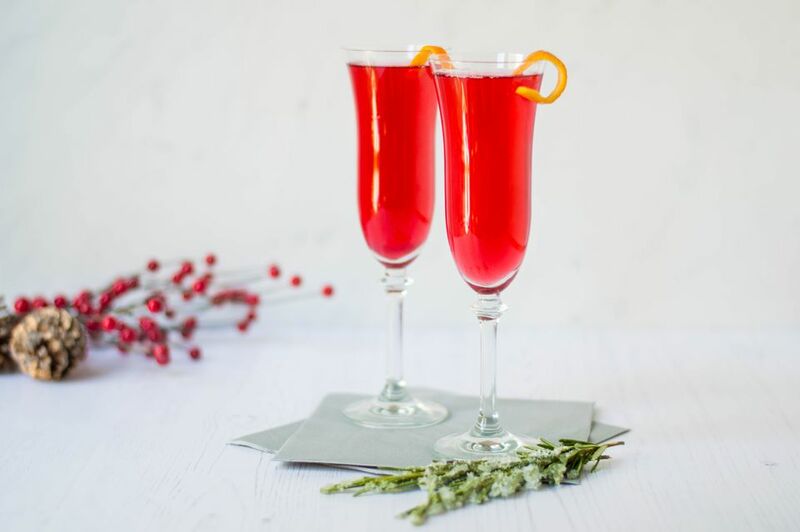 The poinsettia is an elegant cranberry and Champagne cocktail that is perfect for holiday parties. There are a number of recipes that take on this name, though this is one of the easiest you will find. This poinsettia requires just three common ingredients and it mixes up quickly. There's no fuss or special technique and in just a minute or so, a great drink will be ready for your guests to enjoy. The simplicity is part of its beauty and the flavor is one that has universal appeal. It is, quite simply, an excellent option for celebrations of any size. Pour the orange liqueur and cranberry juice into a chilled Champagne flute. Since there is no ice involved in making the poinsettia, you'll want to chill the ingredients before mixing the drink. Place the bottles in the refrigerator for an hour or two before the party and you'll be good to go. Champagne cocktails do not require the absolute best wine. This is particularly true when its paired with a heavy flavor such as cranberry, so feel free to be a little frugal. There are many great budget-friendly Champagnes available that are perfect for cocktails. On the other hand, it's not necessarily wise to pinch pennies when it comes to the orange liqueur. Cointreau would be the top recommendation and Combier a close second, though there are other nice options available. Line up the flutes, then pour and mix the orange liqueur and cranberry juice before the party gets started. When it's time to serve, top each glass with Champagne and hand your guests a fresh, sparkling drink. Pre-mix the liqueur and juice in a serving pitcher and keep it in the refrigerator so it stays cold. As each guest arrives for their cocktail, pour the fruit mix then top it off with fresh bubbly. Champagne is not your only option and wines like Cava, Prosecco, and Moscato d'Asti are fantastic substitutes in any cocktail. If you're looking to cut your costs, you'll often find that an Italian Prosecco is one of the best ways to go.